The weather in the Bay Area wasn't all that great over the weekend. It's been rainy and very windy. Making rice soup seemed the appropriate recipe for this type of climate. 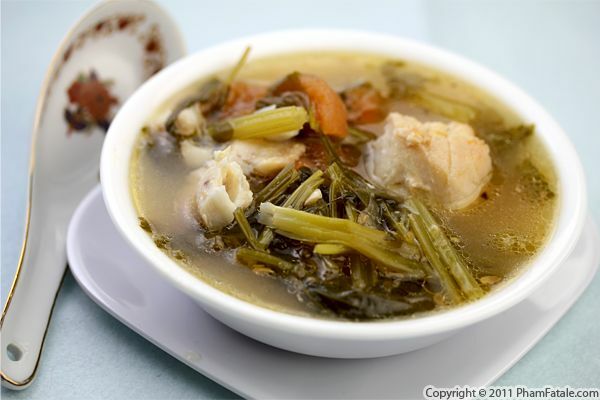 If you’ve never had it, rice soup is a one-dish meal that is both filling and satisfying. 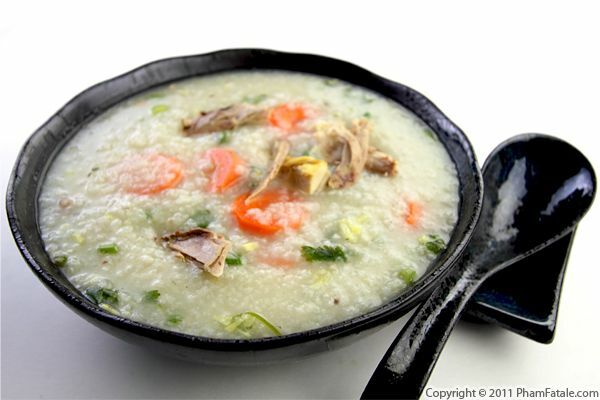 You can add many different ingredients to your basic rice soup, but I made this particular version with my favorite meat: duck. It's called cháo vịt in Vietnamese. I find duck meat to be a lot more flavorful than regular chicken. Traditionally, it would be served with gơi vịt (Vietnamese duck salad using the remaining meat from the duck stock) and chopped bánh giò cháo quảy, which are Vietnamese savory beignets. I skipped the fried food to keep the meal healthy; I even took the time to strain and remove the extra fat floating at the top of the duck stock! This soup, called bún riêu, is typical Vietnamese comfort food. 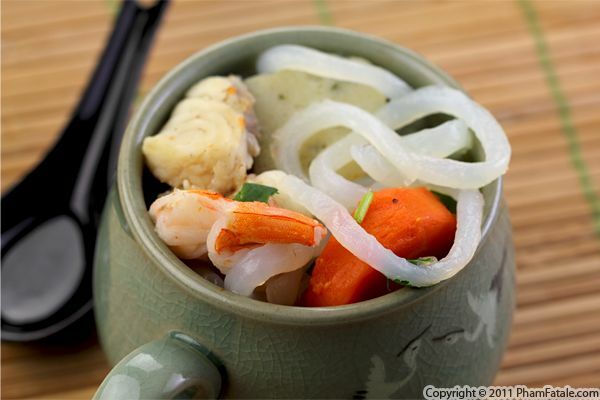 It's paired with the usual Vietnamese aromatic herbs and topped with other vegetables and fried tofu for a complete meal. Just thinking about this seafood dish makes my mouth water! Tomorrow, my cousin Tri and his wife Tran are coming over to greet us for the Lunar New Year. So I spent today making a delicious, though a tad time-consuming (but oh-so worth it) soup dish for them. 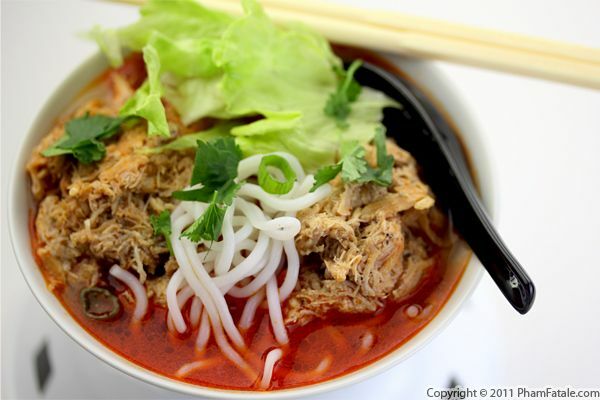 Bún riêu cua is a briny crab rice noodle soup garnished with feathery-like crab cakes in tomato and fermented shrimp (called mắm tôm) broth. 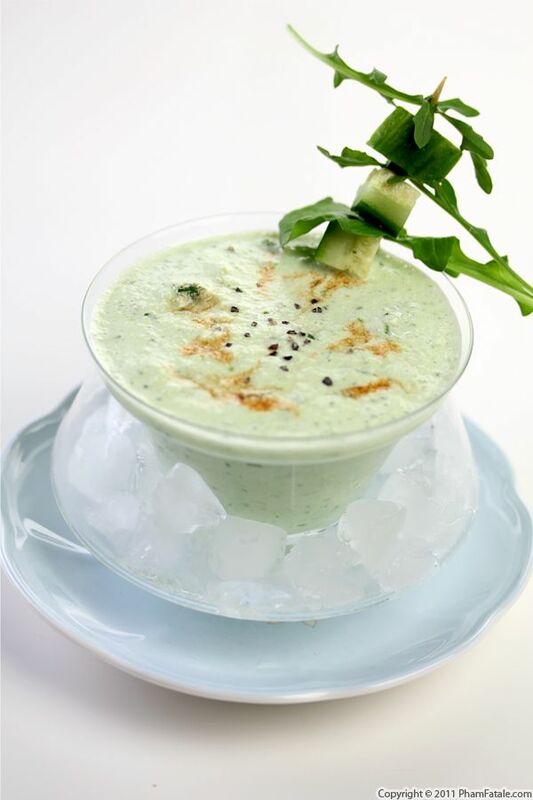 Once you're ready to serve, shredded lettuce and mint finish the dish for added crunch along with lime and a drizzle of nuoc mam. If you love crab, this dish is ideal for you. If not, you could always try the veggie version (bún riêu chay) I make for the rest of my family members who are vegetarian. Either way, what a great way to start the year! Page 9 of 18 pages.